Mahatma Gandhi’s grandson on nonviolence, his grandfather’s legacy and activism from Hong Kong to Ferguson. Arun Gandhi was 14 years old when his grandfather, Mahatma Gandhi, the most prominent leader in India’s independence movement, was assassinated. It was 1948, just one year after the country gained independence from Great Britain. Two years prior, Arun’s parents had sent him to live with his grandfather in India from Durban, South Africa. They feared he would succumb to violent retaliation following two incidents in which white and black South Africans had brutally beaten him. From age 12 to 14, Arun lived with his grandfather, who imparted his teachings of nonviolence, anger, spirituality and discipline. 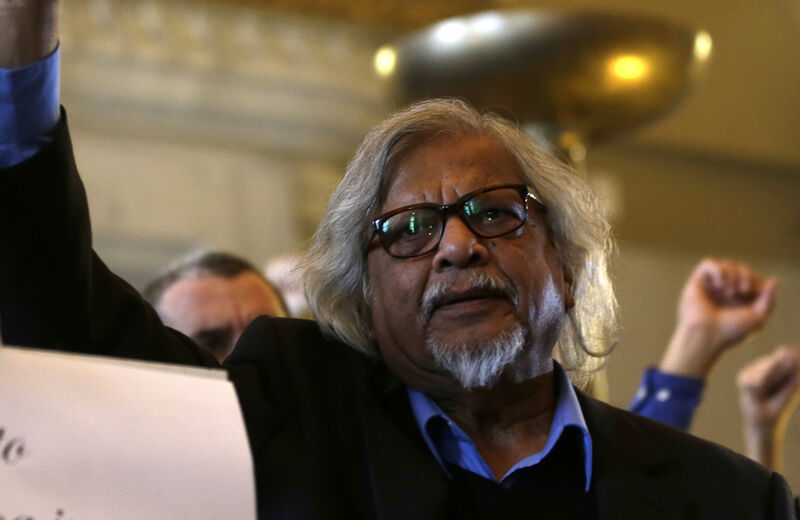 Today, Arun Gandhi is the co-founder of the M.K. Gandhi Institute of Nonviolence, a nonprofit organization based in Rochester, New York, dedicated to fostering knowledge and principles of nonviolence in individuals and organizations. Earlier this year, Gandhi published his ninth book, Grandfather Gandhi, which follows the abiding relationship between Arun and Mahatma and the lessons Arun learned from his grandfather. In a conversation with The Nation, he shared his thoughts on nonviolence, his grandfather, his new book and activism. This interview has been edited and condensed. N’Kosi Oates: What is violence and nonviolence? Arun Gandhi: Violence is not just the physical violence that we become concerned about but it’s the passive violence: the non-physical violence that we commit every day. Exploiting people, discriminating against people, wasting resources, creating disparities in society—some people are rich, some people are very poor—all those things are all forms of violence. It’s that kind of non-physical, passive violence that generates anger in the victim, and the victim then results to physical violence to get justice. A nonviolent society and nonviolent individual would be one who lives in harmony with all of creation; one that has a lot of love and respect for everybody considers everybody to be equal, learns to share things with other people, and not to be selfish and self-centered. NO: What gave your grandfather the strength to continue his work? AG: I think it was his desire to get independence, and the realization that independence is the only way to create a better world for the Indian people. Also, the commitment and humility he had—believing that he could achieve what he could achieve and not be disheartened by things he couldn’t achieve. Every one of us has limitations. We can’t change the whole world or get the results we expect. We have to accept that and do our best. NO: What do you think is your grandfather’s legacy? AG: I put it in one sentence: “Be the change you wish to see in the world.” He expected every individual to be the change. If we want the world to change from what it is today to something better, then we have to become that change…. A lot of people today feel that change will be legislative [or] come from the government. That can’t happen. [The] kind of change he was envisioning is not something you can legislate and force by law. It has to come from within, from realization and understanding. NO: What’s your view of the protests happening in Hong Kong and Ferguson? AG: I think it’s a wonderful thing the young people in Hong Kong are doing. I only hope that they know exactly what they’re looking for, what could happen to them and they are prepared for that. A lot of times people come out in that emotional moment and launch a nonviolent startup, but at the first sign of repression they give up and resort to violence. That shouldn’t happen. They have to really understand the philosophy of nonviolence. It’s not enough to say we are not using violence. We should not show violence in our words, our actions. There should not be “us and them” attitude. There should not be a feeling that they are our enemies and we will destroy them. These are little things that we have to be very conscious of because all of that adds up. We may not be physically violent, but if we show violence in our anger and frustration, it’s the same thing. What’s going on in Ferguson is unfortunate. It’s the result of the fact that there’s a lot of prejudice and discrimination still continuing in this country, which will not go away with this kind of confrontational attitude. We have to create an atmosphere with love and respect, where the people’s heart will change. Aggression makes everything worse…. Everybody is prejudiced. Nobody is free of that. We have to acknowledge that, understand that and change our attitudes. It’s only through that everybody else will change. As long as point fingers at somebody else, without realizing that there are fingers pointing back at us, we aren’t going to dissolve any issues. NO: What gives you hope today? AG: What gives me hope is [what] my grandfather said, “Peacemakers are like farmers. Just as a farmer goes out into the fields and plants and hopes and prays he would get a good crop, in the same way peacemakers only go out and plant seeds in the minds of people and hope and pray that those seeds will germinate and [that] they would have a good crop.” I take every opportunity I get to speak to people, plant the seeds and just hope that some of them will germinate. NO: Your most recent book is Grandfather Gandhi. This is your first children’s book. Why write a book for children? AG: I always had these lessons that I learned from my grandfather as a child. They made a profound impact on me growing up.… I wanted to take that message to children, but I didn’t have the means or the understanding [of] how to write for children. I was looking out for somebody to [write with], and by chance Bethany [Hegedus, the co-author] came up and offered her services. NO: What advice would you give to the millennial generation in sustaining movements and advocating for justice and equality? AG: My generation of people created a real mess, which for your generation will inherit. Now it’s up to you whether to continue to wallow in that mess, or bring about the change to make the world a better place. You are going to be the leaders of tomorrow. You are going to inherit this world. You can have the capacity to change it and make it a better place. It’s not going to happen in any one person’s lifetime. It’s going to take a long time, many lifetimes to do it, but somebody has to make the beginning. N’Kosi OatesN’Kosi is a freelance writer. His work focuses on blacks and politics, social justice, black male identity, black feminism and pop culture.